Also: "Douchebag" or "Jersey Shore Reject" or the timely "K-Fed"
Time is a funny thing. Back in the 1950s, Rock & Roll was a huge deal and parents didn't necessarily approve of the kids and their new music. 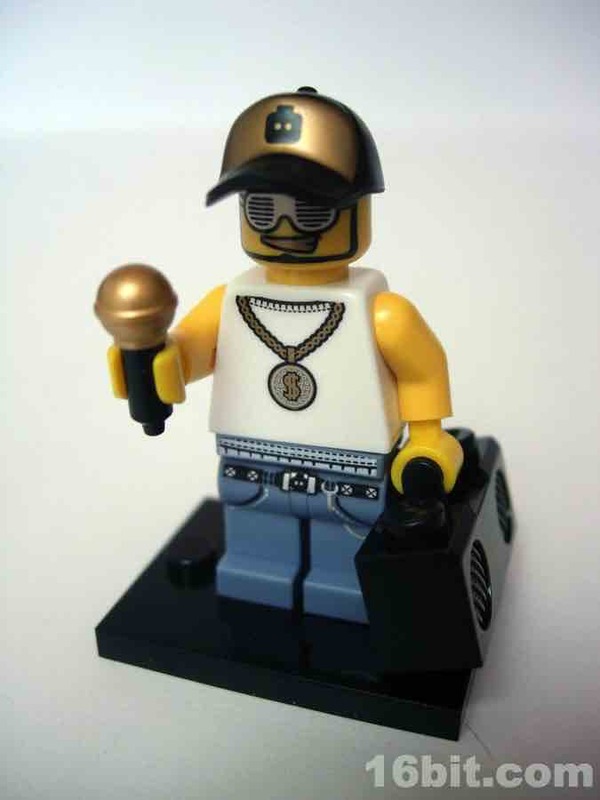 The same thing happened with rap, and the surest sign that your mind-blowing genre of music has lost its edge is when they co-opt it in the toy aisle. Rock & Roll Ernie or Mickey Mouse dolls serve as a reminder that the message of Iggy Pop was not clearly understood. 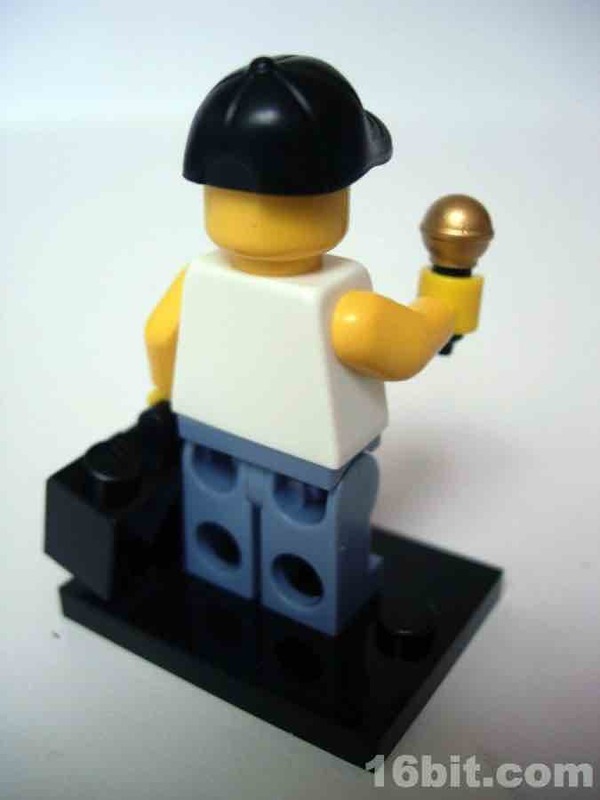 Nothing says "losing its edge" like getting a generic LEGO version of whatever it is you do, like the Rapper here. 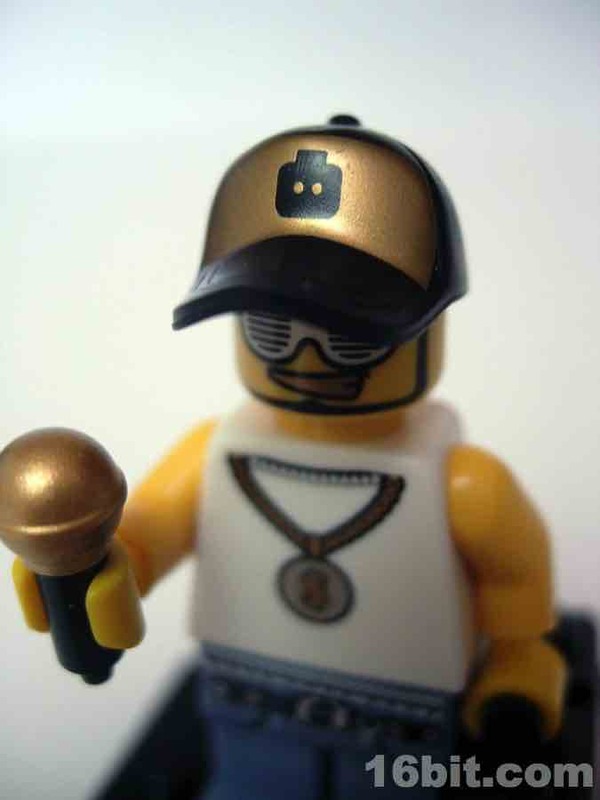 Granted, this is a silly rapper, but he still has a grill and a swell hat and belt. 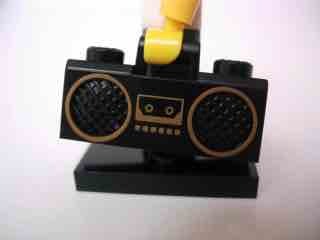 The boombox, or perhaps "ghetto blaster," was introduced into the Minifigures line with this release. It's a simple 4x1 brick with sculpted details on the side, and painted gold highlights showcasing the cassette door and its buttons. Cassettes? Wow. That's old school, yo. 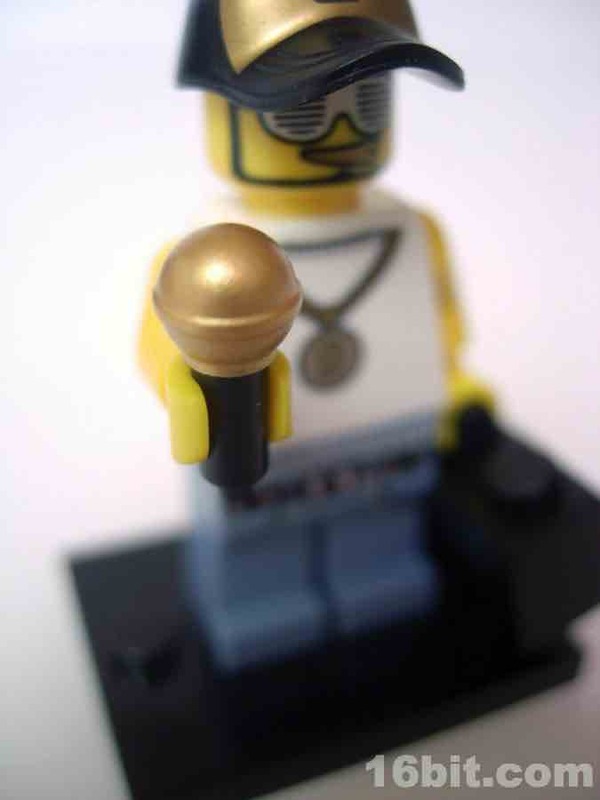 It sports a matching microphone with a gold tip, and a fairly ornate outift despite being a simple ensemble. A white undershirt and jeans should be pretty dull, but if you get in real close you can see all sorts of amazing detail. 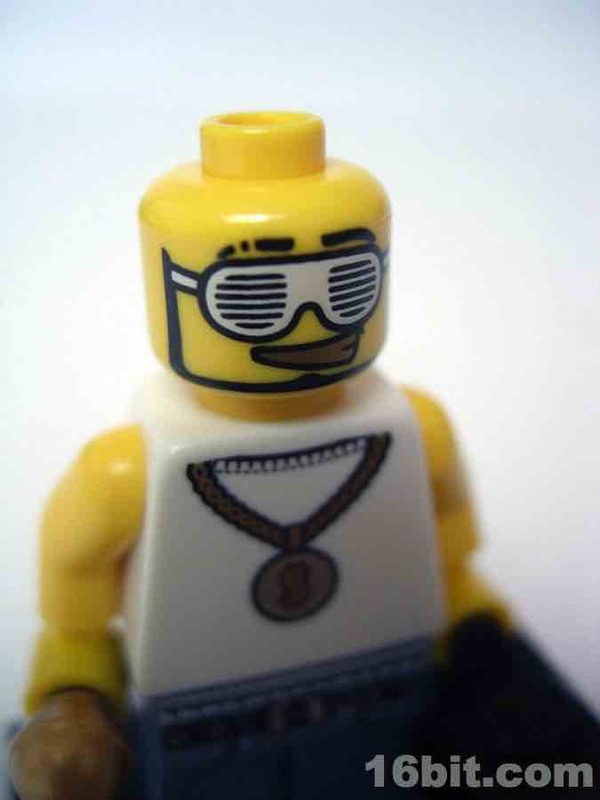 The head alone sports amazing goofy glasses, gold teeth, and oddly trimmed eyebrows. The beard is also neatly trimmed, and a nice touch. His shirt has a gold chain with a dollar sign on it, plus a painted t-shirt collar. 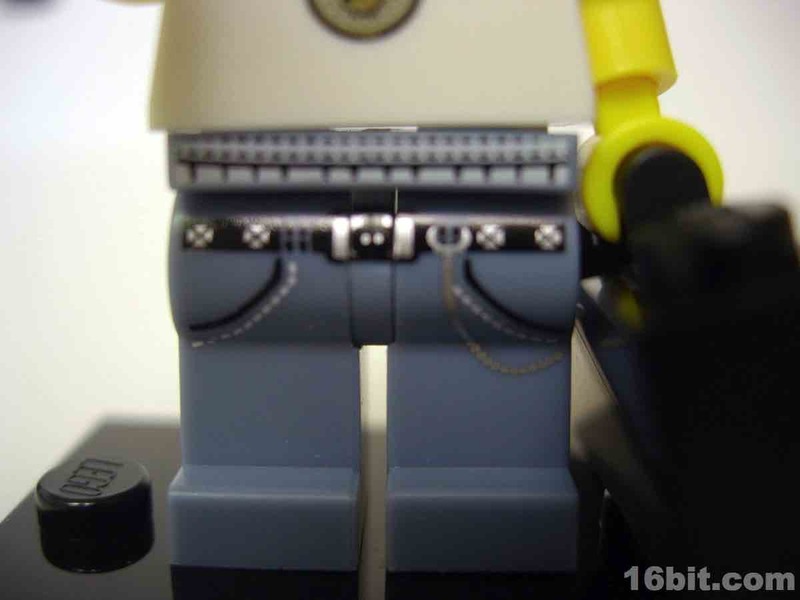 While hard to shoot, the pants have amazing detail-- check out the wallet chain, painted pockets, and even a LEGO head on the belt buckle with silver and black paint bringing the garment to life. Oh-- and you can also see the wasitband of his underpants. How can you not love this? The detail is wonderful. 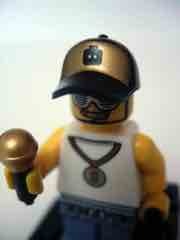 I think this figure was one of Series 3's many highlights. You really ought to get this one if you build LEGO towns and buildings, this guy is just too awesome to ignore.